A great bartender doesn't just know how to make a cocktail. He remembers what you're drinking, what your friends are drinking, what the six people behind your friends are drinking, who's drinking too much, all the while keeping the other 40 people in the joint happy when the bar is rocking. And he does it all by himself! 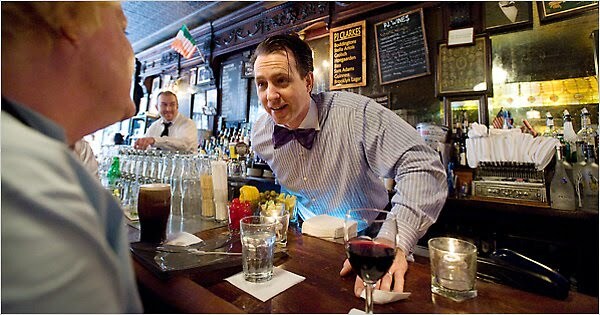 Apparently, in New York City the man who is considered the city's "bartender's bartender" is Doug Quinn at P.J. Clarke's on the East Side. Not only does he do all of the aforementioned multitasking magic, according to Quinn, “A great bartender will get you a date for the evening, get you a job, and get you a new apartment.” And make a perfect cocktail? Now this is a man I can respect! 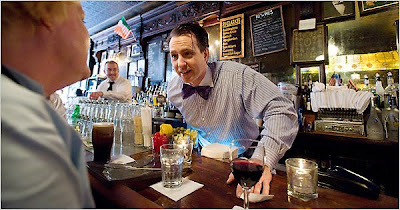 Click here to read a thirst inducing profile of Quinn by the NYT's Frank Bruni. And it most definitely wouldn't hurt to have a Manhattan in hand while you're reading along! The HUB of Lower East Burnside?